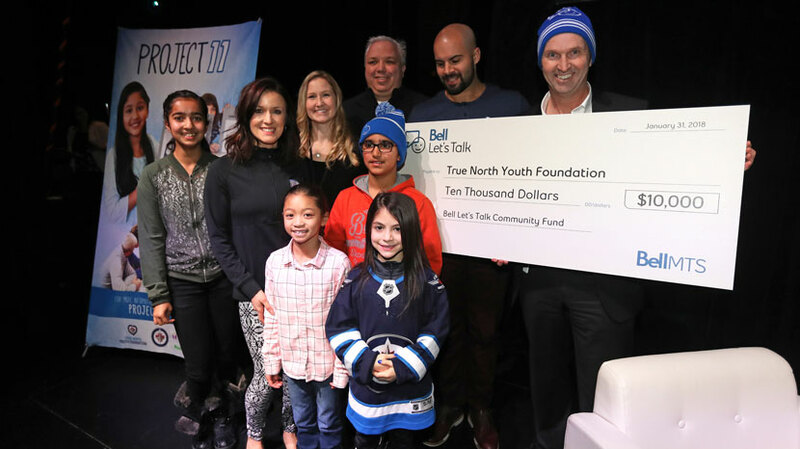 The True North Youth Foundation (TNYF) is pleased to announce it was presented with a $10,000 grant from the Bell Let’s Talk Community Fund during today’s inaugural P11 Mental Wellness Summit, held in conjunction with Bell Let’s Talk Day. Introduced in 2015 in memory of Manitoba Moose and Winnipeg Jets player Rick Rypien, Project 11 is a preventative cross-curricular program centred around helping students in grades 5-8 develop positive mental health coping skills to deal with life’s daily stressors. The project also aims to remove the stigma and fear of judgement that can accompany mental wellness issues, while enhancing students’ academic performance. The Bell Let’s Talk Community Fund grant will be used to facilitate Project 11 teacher training and classroom presentations in Northern Manitoba starting this school year. Eight northern Manitoba classrooms are currently participating in Project 11, and the program’s resources will be of great benefit to more schools in this region. This school year, more than 500 educators from 200 schools have implemented Project 11 curriculum. This translates to more than 11,500 students discussing mental wellness more openly, and gaining skills and strategies to help them cope more effectively with challenges and stress in their school, personal and future work life. The Bell Let’s Talk initiative promotes Canadian mental health with national awareness and anti-stigma campaigns like Bell Let’s Talk Day, and provides significant Bell funding for community care and access, research and workplace initiatives. To learn more, please visit Bell.ca/LetsTalk. Project 11 teacher training is ongoing and there is still an opportunity to register classrooms for the current academic year. Teachers can visit projecteleven.ca for more information about the program and to register.